Last week, OzHarvest hosted a sneaky sneak peek at whats to expect from the annual CEO CookOff, being held for the fifth time this year on March 7. To mark another milestone and a new venue, The Cutaway at Barangaroo Reserve, as well as launching the event in Brisbane, OzHarvest welcomed media and a small number of CEOs to its warehouse for a bit of culinary fun. The likes of James Symond, Aussie CEO, Luke Baylis, SumoSalad CEO, and Charmaine Moldrich, CEO of Outdoor Media Association, gathered together for a mini CEO CookOff to get the various industries rallying for a good cause – and their CEO of choice. From salmon entrees, ragout lasagne and rhubarb chocolate dessert, media, CEOs and guests put their chef hats on (not literally) to raise awareness and make food to be delivered to charities. 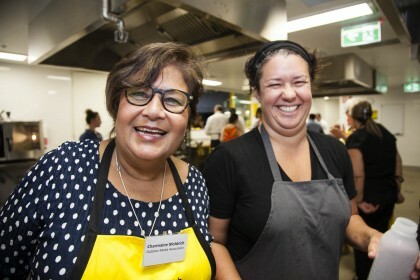 The OzHarvest CEO Cookoff is the food-rescue organisation’s flagship annual event, aimed at increasing awareness on food insecurity, homelessness and food wastage in Australia. To date, the business community has raised more than $4 million dollars for this unique charity event. CEOs and senior business executives from across the country are encouraged to register alongside an exceptional line up of chefs including Matt Moran, Neil Perry, Peter Gilmore, Guillaume Brahimi and Dan Hong featured at Sydney’s event. OMA CEO Charmaine Moldrich said two big reasons it was so important to support OzHarvest was “the work it does in feeding vulnerable people and that it saves so much food”. “This is a cause I really believe in,” she said, adding it was an “added bonus” being able to do this alongside her daughter O Tama, one of the chefs participating in the event. Moldrich also said she hoped “the advertising industry will get behind me”, and they can, with donations for the CEO CookOff being made here. Fifty of Australia’s top chefs with a combined 38 Chef’s Hats, will team up with 150 business leaders to cook for more than 1,300 homeless and vulnerable Australians on March 7. “The business sector and its leaders play a crucial role in helping organisations like ours address and find solutions to the issues of poverty, homelessness, hunger and waste,” OzHarvest founder and CEO Ronni Kahn said. Businesses can also take part in the Company Challenges involving cooking challenges and fundraising activities within the workplace. Anyone can support the cause by donating to their favourite CEO or chef. Every $1 donated means that OzHarvest can deliver the equivalent of two meals and has a Social Return on Investment value of $5.68. To donate head to www.ceocookoff.com.au and sponsor a CEO or chef.